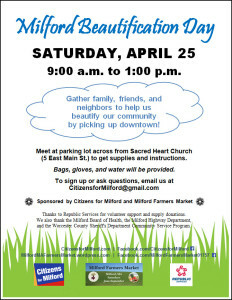 We Need YOU This Saturday to Beautify Milford! bet ween 9:00 a.m. and 1:00 p.m. this Saturday, April 25th, to help clean our community! Meet us in the parking lot across from Sacred Heart Church to munch on a few donuts, chat, then pick up your assignment and work gloves. We will be there rain or shine! Families, community groups, churches, local businesses, and teenagers who need to perform service hours are all invited to participate. Younger children are encouraged to attend as long as they are accompanied by a supervising adult. Free t-shirts will be given to the first 100 volunteers who show up. All supplies and t-shirts are being donated by Republic Services. 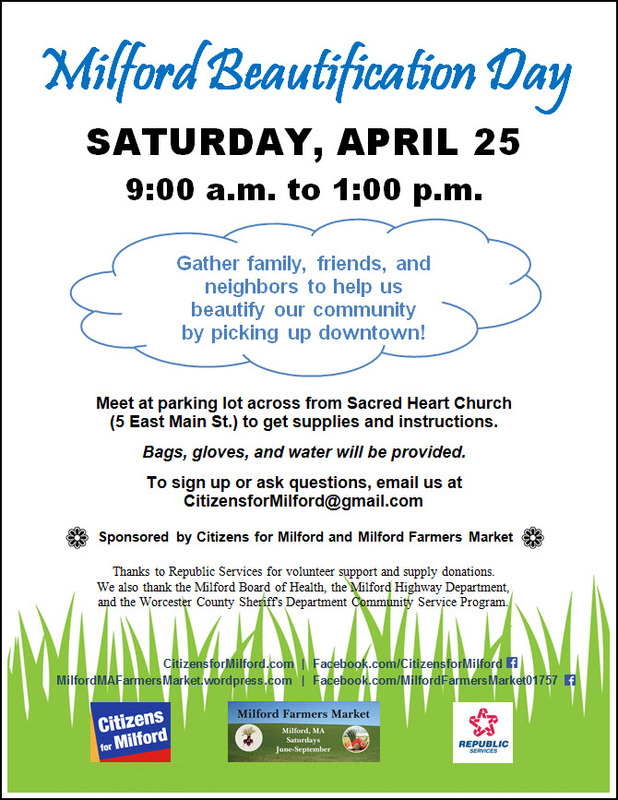 Citizens for Milford and the Milford Farmers Market are grateful for the assistance, volunteer support, and donations provided by the Milford Board of Health, the Milford Highway Department, Republic Services, and the Worcester County Sheriff’s Department Community Service Program. Help us spread the news! Download a copy of our flyer and hang in your business window or give to a neighbor!